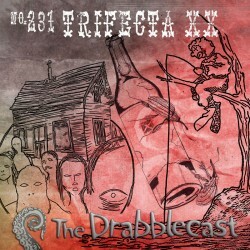 Our feature originally aired in Episode # 113 way back in 2009. It is a unique tale set inside a televised cartoon world. Our main character, Charlie the purple giraffe, has a disturbing and profound view of his world, one not shared by his best friend Jerry the orange squirrel. Floating question marks, colored word balloons, it may not be as light, airy, and humorous as appears at first blush. Stick around or skip ahead to minute 22:00 for Part 2 of the episode, with Special Commentary and conversation with David and Norm. 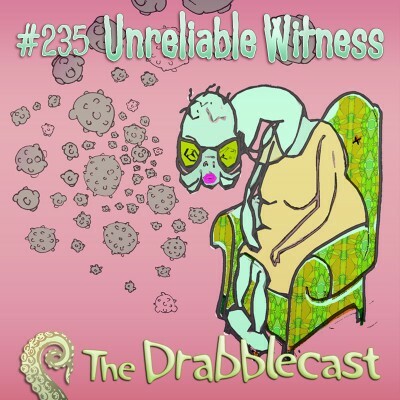 In this episode of the Drabblecast, Catherine is an 89-year-old nursing home resident plagued by someone who keeps taking her things and a son and daughter-in-law who treat her like a child. When she gets a visit from an alien named Tom, they strike a bargain: He will tell her who the thief is if she tells him the secret to longevity. His race does not live to old age, they die after reaching breeding age and having children (the human equivalent of about 40 years old); he is trying to learn how to extend their lifespan. Despite her insistence that there is no secret he doesn’t believe her, but does tell her no one is taking her stuff – she just can’t keep track of it. Catherine thinks he is lying because he didn’t like that she didn’t have an answer for him and becomes convinced that the people who are taking her stuff are actually looking for alien, looking for clues about their existence among her possessions. She makes a tape recording of her experience, hoping that when they inevitably take the tape and listen to it they will realize they have no reason to continue stealing from her since she will freely tell them everything she knows. 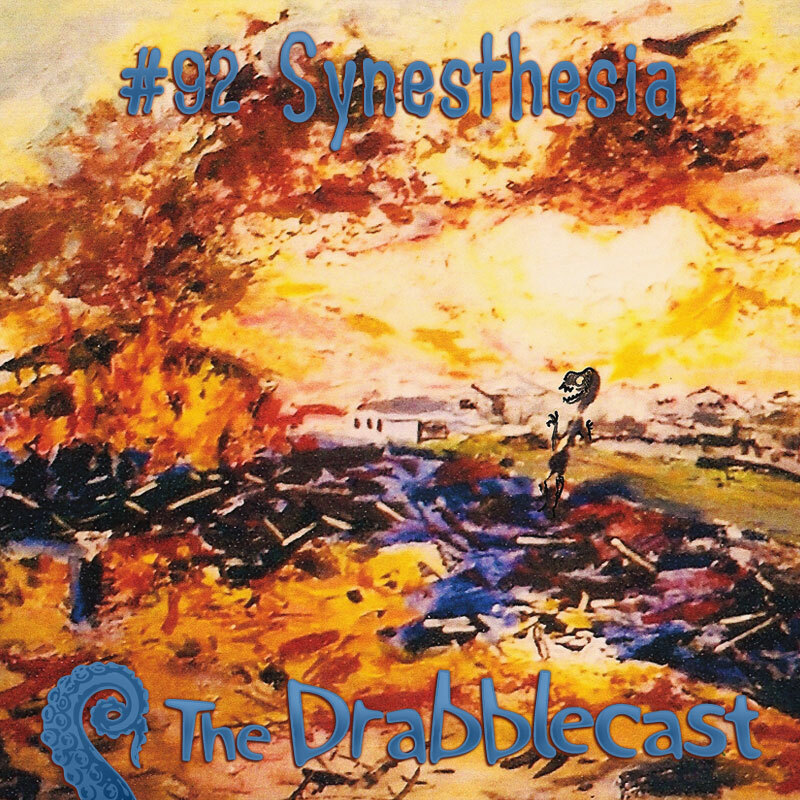 In the drabble, a young girl wakes up with a new set of stitches and doesn’t stop searching until she finds the quarter the kidney fairy has left her. 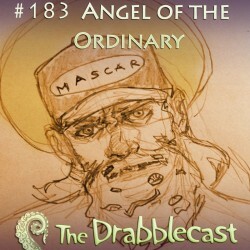 This episode of Drabblecast starts with Norm recommending and playing an excerpt from Frank Key’s story anthology. In the feature we learn about Mr. Wayne, a man who visits the store of the world in order to discover his deepest desire. Is it simply an escape from a post-apocalyptic world, or is it something more? 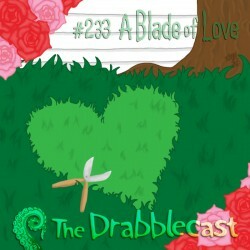 This episode of the Drabblecast is all about crazy relationships. In the drabble, it’s apparent that finding Mr. Right is difficult no matter who (or what) you are. 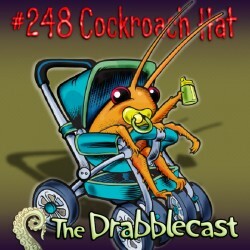 In the feature, Sam wakes up one day to discover he has been transformed into a giant cockroach. He spends the rest of his day on a surreal quest, not only to return to his normal self, but also to save his girlfriend from threats both mundane and extraordinary, with the hope a new start together. We bought our first yarn baby at a garage sale. The ends of its arms were frayed and its eye buttons dangled loose on bare threads. 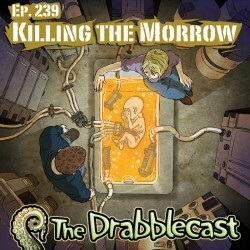 This theme of this episode of the Drabblecast is family unties: Nontraditional homes and family situations. 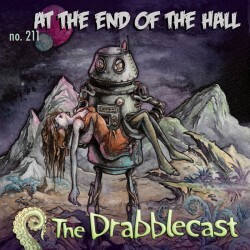 In the drabble, the enterprising resident of a haunted house fools its ghosts into performing everyday domestic tasks. In Divorce in the House of Flies, a young boy has to deal with his parents’ divorce at the same time he has to deal with their transformation into human-shaped masses of tiny insects. In Wendigo Bake Sale, residents of a small town overcome their initial terror of a pair of wendigo participating in the school bake sale, only to be frightened anew when the wendigo reveal they are supporting the school because their child attends. 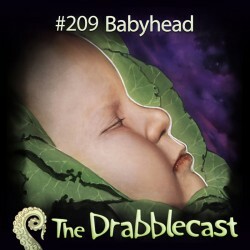 In Knit, after losing their first yarn baby during her rebellious teen years in a tragic unraveling accident, a couple tries vainly to reconstruct her from the scraps of yarn, stuffing, and buttons left behind. 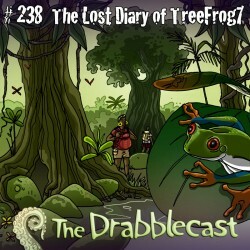 In this episode of the Drabblecast, heavily pregnant jungle explorer TreeFrog7 keeps a recorded diary of data she and her husband are collecting for the Forbidden Greeny Jungle Field Guide. As they close in on a legendary mature CPU plant (MCPU), a wild version of cultivated CPU plants used as personal computers, they encounter numerous jungle creatures including an enormous flightless moth protecting the plant. Despite its attacks, the explorers do not want to kill the moth in case the MCPU needs it to survive. While treed by the moth in the MCPU, TreeFrog7 gives birth to their daughter while her husband downloads the MCPU’s data. Close enough to see the MCPU’s monitor, they watch a rapidly shifting display of locations and symbols. TreeFrog7 realizes the images are getting closer to their own location and represent another explorer’s collected data. Finally, the scene fades and the monitor shows only two eyes. 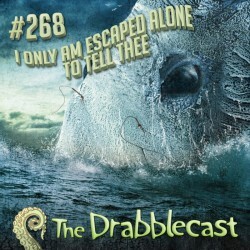 The diary ends with an entry by an unknown voice that implies the explorers have themselves been collected. 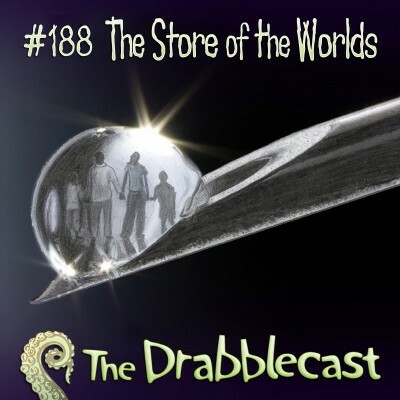 In the drabble, a teenage boy fails to convince an uninterested, gum-snapping girl that he understands her feelings of otherness and isolation. My earliest fear, the one I remember anyways, was of great pulp magazine robots with hot water heater bodies and vacuum tube eyes. My brother forbade me to touch his precious magazines, so I wouldn’t. I’d stare and stare at the covers through; hourglassed damsels in diaphanous gowns draped over thick slab altars, and the robots, always the robots with their cylindrical torsos and pincer claws for hands…. Cynthia couldn’t explain what she’d just seen in the vegetable patch. She didn’t want to look again. She considered going back into the house, crawling back into bed with Mikey, and putting it down as a beer-inspired dream. 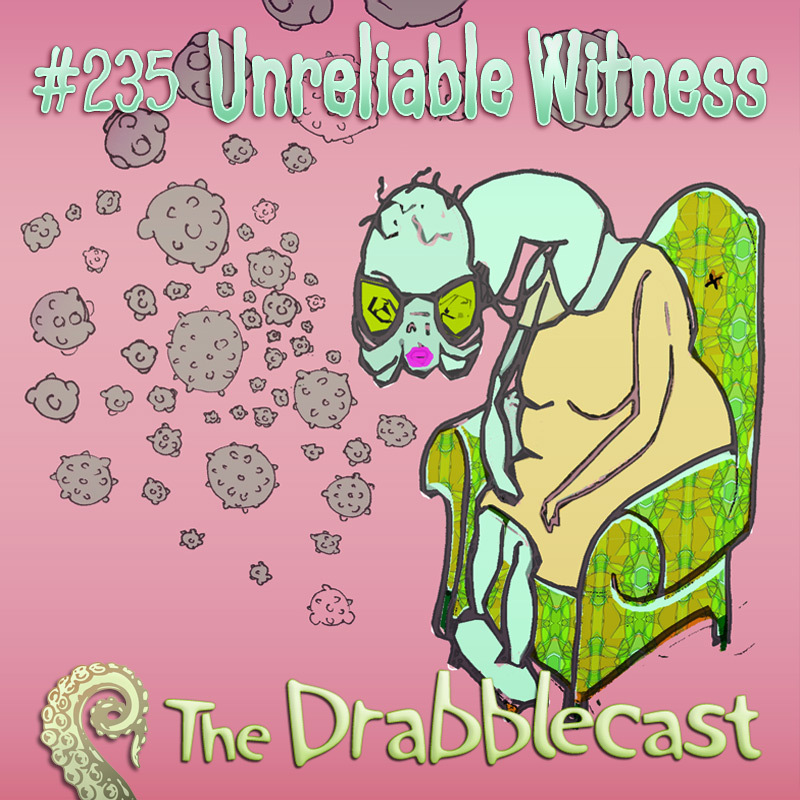 Tales of parental love gone awry in this week’s unsettling Drabblecast. 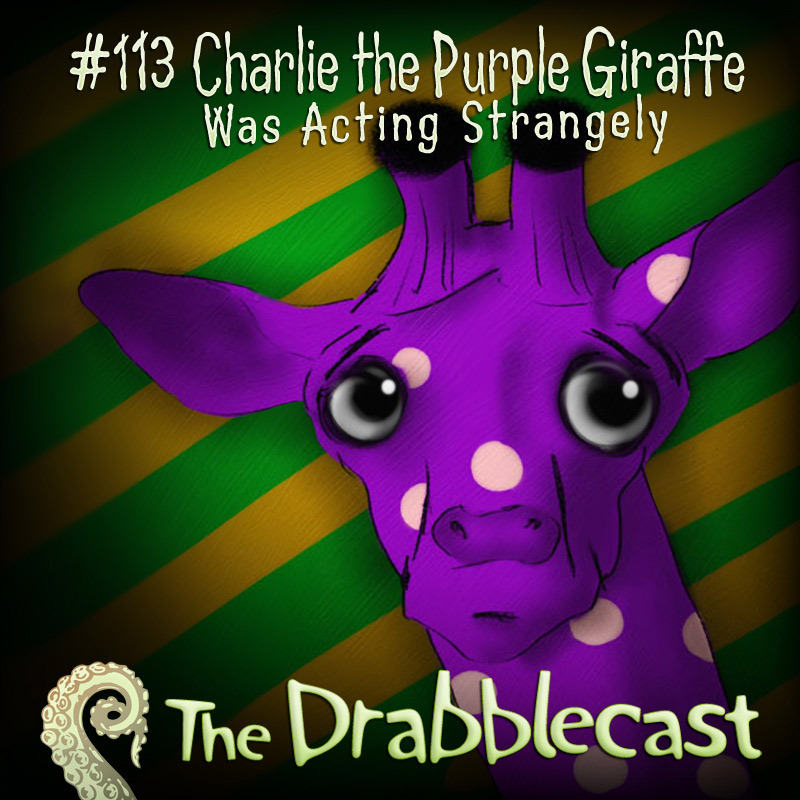 This episode brings you Charlie the Purple Giraffe, by David D. Levine. It is a unique tale set inside a televised cartoon world. 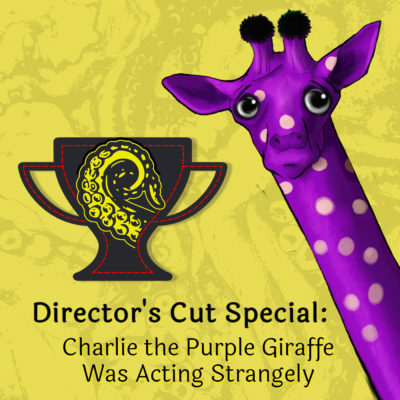 Our main character, Charlie the purple giraffe, has a disturbing and profound view of his world, one not shared by his best friend Jerry the orange squirrel. 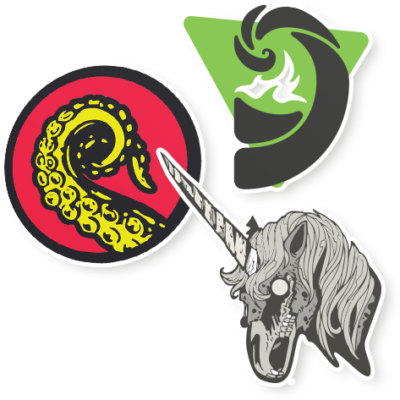 Floating question marks, colored word balloons, it may not be as light, airy, and humorous as appears at first blush.